It would be nice if once in a while Matt would tell us what is going on at School... haa haa haa. I knew there will be some kind of a show at the end of this term, and that was simply because I am a fly on the wall in the class’s Line Group (the mums in Matt’s class have been discussing this). To my knowledge, the costumes have been designed and are now under production. 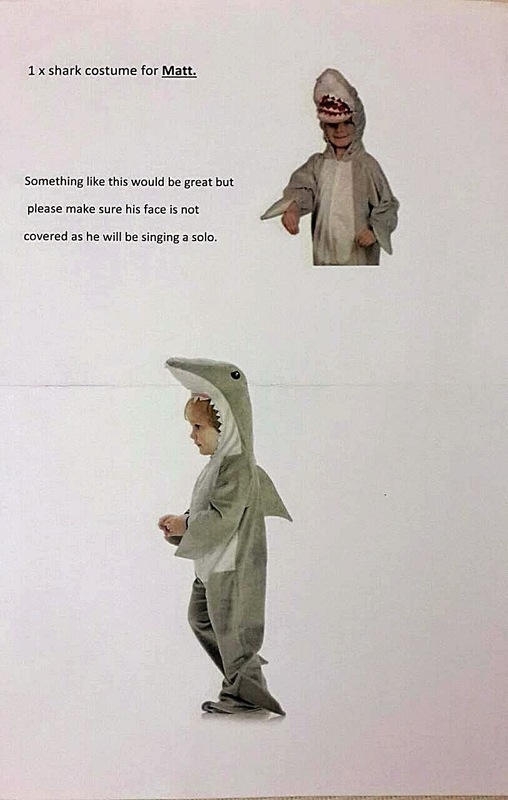 But what Matt have failed to inform us was that he had been chosen to sing solo... and wearing a shark suit... and you know how we found out??? We only found out because we saw this in the Line Group... haa haa haa haa haa. Last time, Matt was the main character as Humpty Dumpty and for another show he was one of the main narrator... for those two shows your mother made you (and I) practice every night for months! haa haa haa. I can still hear her saying... “You two should take this more seriously... Matt say your lines with more emotion and passion... Pa stop messing around... and etc...” haa haa haa. Now it’s singing solo... wow I am guessing I’ll have to learn the lines with Matt again... haa haa haa, don’t worry I’ll do my best... haa haa haa.